The TI-30XA is an inexpensive scientific calculator approved for use on SAT and ACT tests, two of the most common college entrance exams, and on Advanced Placement exams. 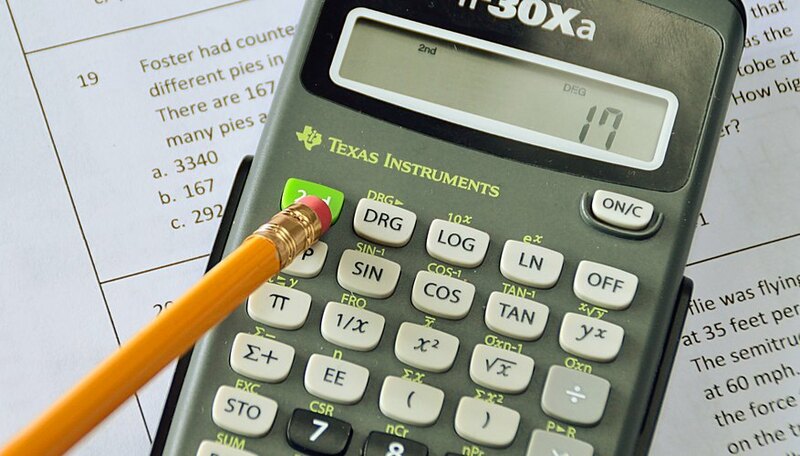 You may not take your own calculator to these exams, so become familiar beforehand with specific capabilities and limitations of the TI-30XA calculator handed out with the test. Pay special attention to the second function key, the way you use calculator memory and the keystrokes needed for decimals, fractions, mixed numbers, exponents and powers. You’ll seldom employ some of the 30XA’s more esoteric functions when taking the college entrance and Advanced Placement tests. One key function that you may not be familiar with, however, is essential for successful completion of the test. This is the yellow [2nd function] key at the upper left-hand corner of the keyboard. This key shifts the focus away from the function on the face of the key and onto the function printed in yellow above it. For example, to find 17 percent of 342, you enter  [x] , then press [2nd function] . This activates the second function that appears in yellow above the 2 key, which is [%]. The order of keystrokes matters when using the 2nd function key, which always carries out the operation on the value you keyed in immediately before you hit the 2nd function key. If you key in  [x]  [2nd function]  instead, the calculator will compute the value for 342 percent of 17. Hit the [STO] key to store a number in one of three memory areas. For example, to store the product of 20 x 167 in memory one, hit  [x] , [STO] . To recall a number from any of these memory areas, hit the recall key, [RCL], followed by the number of the memory area. For example: [RCL] . The entry process for fractions and mixed numbers takes time to get used to. To enter either a fraction or a mixed number use the [a b/c] key in the left-most column -- the second key from the bottom. The order entry for 1/2, for example, is  [a b/c] . Convert mixed numbers to fractions using the 2nd function on the [a b/c] key. For example, to convert 3 1/2 to an improper fraction enter the mixed number, then hit the 2nd function key, then the [a b/c] key. The second function of the [a b/c] key is [d/c]. For example: [3 1/2] [d/c] becomes 7/2. Gleeson,, Patrick. "How to Use a TI-30XA." Sciencing, https://sciencing.com/use-tixa-5157953.html. 18 May 2018.